one of the most popular female vocalists in Britain during the last half of the 20th century Dame Shirley Bassey, DBE was born on this day 8th January in 1937). She found fame in the late 1950s and is best known for recording the theme songs to the James Bond films Goldfinger, Diamonds Are Forever, and Moonraker and is a UNESCO Artist for Peace. She attended Moorland Road School where her strong voice. was noticed by teachers and students alike She also sung in the school choir. After leaving Splott Secondary Modern School at the age of 14, Bassey first found employment packing at a local factory while singing in local public houses and clubs in the evenings and weekends. The Late, Great Graham Chapman would have celebrated his birthday on 8th January had he not tragically died in 1989. He started out in the 1960’s writing professionally for the BBC alongside John Cleese, initially for David Frost, but also for Marty Feldman. Chapman also contributed sketches to the BBC radio series I’m Sorry, I’ll Read That Again and television programmes such as The Illustrated Weekly Hudd (starring Roy Hudd), Cilla Black, This is Petula Clark, and This Is Tom Jones. Chapman, Cleese, and Tim Brooke-Taylor later joined Feldman in the television comedy series At Last the 1948 Show. There, Chapman displayed a gift for deadpan comedy (particularly evident in the sketch “The Minister Who Falls to Pieces”) and for imitating various British dialects. Chapman and Cleese also wrote for the long-running television comedy series Doctor in the House. Chapman also co-wrote several episodes with Bernard McKenna and David Sherlock. Their next studio album Adrenalize reached number one on the U.S. Billboard 200 and UK Album Chart in 1992, and contained several hits including, “Let’s Get Rocked” and “Have You Ever Needed Someone So Bad”. Their 1993 album Retro Active contained the acoustic hit song “Two Steps Behind”, while their greatest hits album Vault released in 1995 featured track “When Love & Hate Collide. Widely regarded as one of the most influential writers of pop music, the English musician, actor, record producer and arranger David Bowie A.K.A David Robert Jones was born on this day 8 January in 1947. He has been A major figure for over four decades in the world of popular music, and is is also regarded as an innovator, particularly for his work in the 1970s. He is known for his distinctive voice, and the intellectual depth and eclecticism of his work. After changing his name to Bowie in the 1960s, to avoid confusion with the then well-known Davy Jones (lead singer of The Monkees), During the 1960′s He tried music and other art forms such as acting, mime, painting, and playwriting. But it was not until July 1969 that he first caught the eye and ear of the public when his song “Space Oddity” reached the top five of the UK Singles Chart, it’s success was helped by the fact that it was used by the BBC in their coverage of the moon landing. The two albums which followed Space Oddity were not as successful, but one of then included the song “The Man Who Sold The World,” which was covered by Lulu and Nirvana). However after this three-year period of experimentation he re-emerged in 1972 during the glam rock era with a concept album called The Rise and Fall of Ziggy Stardust and the Spiders from Mars,, which was about a flamboyant, androgynous space-age rock star named Ziggy Stardust, and was spearheaded by the hit single “Starman“. Bowie’s impact at that time, “challenged the core belief of the rock music of its day” and “created perhaps the biggest cult in popular culture.” The relatively short-lived Ziggy persona proved merely one facet of a career marked by continual reinvention, musical innovation and striking visual presentation. In 1975, Bowie achieved his first major American crossover success with the number-one single “Fame” and the hit album Young Americans, which the singer characterised as “plastic soul”. The sound constituted a radical shift in style that initially alienated many of his UK devotees. He then confounded the expectations of both his record label and his American audiences by recording the minimalist album Low (1977)—the first of three collaborations with Brian Eno over the next two years. The so-called “Berlin Trilogy” albums all reached the UK top five and garnered lasting critical praise. After uneven commercial success in the late 1970s, Bowie had UK number ones with the 1980 single “Ashes to Ashes“, its parent album Scary Monsters (and Super Creeps), and “Under Pressure”, a 1981 collaboration with Queen. He then reached a new commercial peak in 1983 with Let’s Dance, which yielded several hit singles. Throughout the 1990s and 2000s, Bowie continued to experiment with musical styles, including blue-eyed soul, industrial, adult contemporary, and jungle. His last recorded album was Reality (2003), which was supported by the 2003–04 Reality Tour. David Bowie’s contribution to music has been unique, he has influenced the course of popular music several times and inspired several generations of musicians. His promotional videos in the 1970s and 80s are regarded as ground-breaking, and as a live concert act, he is regarded as the most theatrical of them all. In the BBC’s 2002 poll of the 100 Greatest Britons, Bowie was placed at number 29 and throughout his career, he has sold an estimated 140 million albums. In the UK, he has been awarded nine Platinum album certifications, 11 Gold and eight Silver, and in the US, five Platinum and seven Gold certifications and In 2004, Rolling Stone ranked him 39th on their list of the “100 Greatest Artists of All Time”, and 23rd on their list of the best singers of all-time. To celebrate his 66th birthday he has also released his first single in a decade “Where are We Now?” An album, The Next Day, his 30th studio recording, will also be released in March. 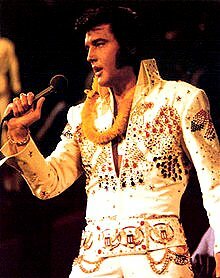 Often referred to as the “King of Rock and Roll” or simply “the King”, Elvis Presley was born on this day 8th January, 1935 in Tupelo, Mississippi. At the age of 13 Presley moved to Memphis, Tennessee, with his family and began his career there in 1954, working with Sun Records owner Sam Phillips, who wanted to bring the sound of African American music to a wider audience. Accompanied by guitarist Scotty Moore and bassist Bill Black, Presley was one of the originators of rockabilly, an uptempo, backbeat-driven fusion of country and rhythm and blues. Presley’s rise to national attention in 1956 transformed the field of popular music and had a huge effect on the broader scope of popular culture.